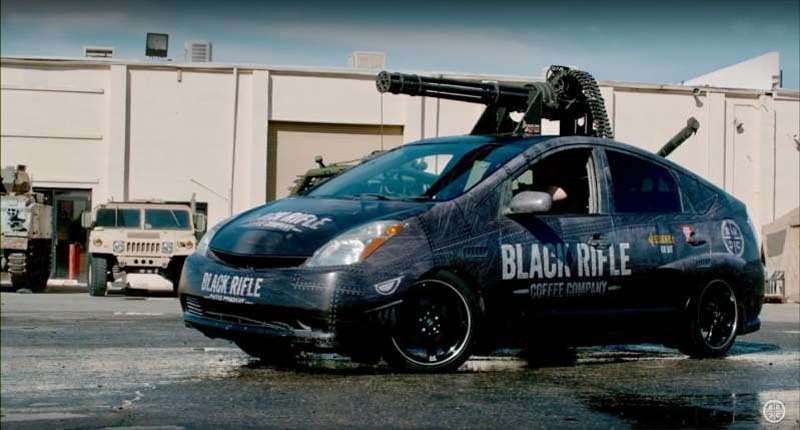 Small-batch coffee producer Black Rifle Coffee Company (BRCC) has turned a Toyota Prius into a rolling platform for a 20-millimeter M61 Vulcan rotary cannon. And yes, that's the same kind of cannon found in Air Force fighter jets. The company detailed the outrageous project via a video posted to its YouTube channel on Thursday, where it states that it chose a Prius "because Raptors are expensive." Presumably, it was referring to the Ford F-150 Raptor, and not the Lockheed Martin F-22 Raptor, which also boasts an M61A2 Vulcan. BRCC says that this gun came not from an F-22, but instead a General Dynamics F-16 Fighting Falcon, and that mounting the weapon to a platform not built to accommodate it was quite the challenge. As for the M61 itself; she weighs 92 kilograms (202 pounds) and fires $27 cartridges at 6,600 rounds per minute, which means it'd cost about $35,640 to fire this weapon—for twelve seconds. In other words, that's almost $3,000 per second or $180,000 per minute. Over 160 man-hours were invested into the build, which involved fully stripping the interior and fabricating a roll cage to mount the M61. BRCC says the mounts can accept "various types of weaponry," suggesting compatibility with other big boy toys. Vulcans have been mounted to civilian passenger vehicles before—Houthi rebels put one on a Toyota Hilux. While the gun's designers in 1946 could probably imagine that the M61 would be bolted to land-based military vehicles like the Excalibur, the notion that a Vulcan would be equipped to a Japanese, hybrid economy car 72 years in the future might have been hard to believe.